Life is full of moments when you don’t know how to act or how to handle yourself in front of other people. In these situations, etiquette is vital for keeping your sense of humor and your self-esteem intact. But etiquette is not a behavior that you should just turn on and off. This stuffy French word that translates into getting along with others allows you to put people at ease, make them feel good about a situation, and even improve your reputation. This book shows you how to take on these situations and make them pleasant. It also gives you great advice for tipping appropriately in all types of services and setting stellar examples for your kids. Full of useful advice and written in a laid-back, friendly style, Etiquette For Dummies has all the tools you need to face any social situation with politeness and courtesy. Sue Fox is the author of Business Etiquette For Dummies and a Professional Member of the International Association of Protocol Consultants. Part I: Starting Down the Road to Better Etiquette. 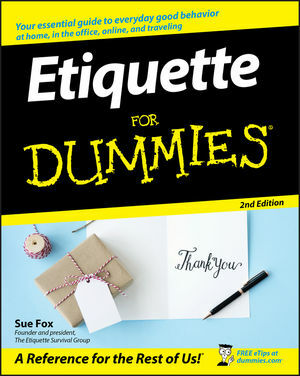 Chapter 1: Examining Etiquette Basics. Chapter 2: Becoming a Model of Good Manners. Chapter 3: Presenting Yourself Positively: Dress, Grooming, and More. Part II: Fostering Well-Mannered Relationships. Chapter 4: Focusing on Courtesy with Your Family. Chapter 5: Appreciating the Art of Friendships and Relationships. Chapter 6: Showing Civility in the Working World. Part III: Converse with Care: Saying Everything Right. Chapter 7: Engaging in Polite Conversation. Chapter 8: Catching Up on Correspondence. Chapter 9: Today’s Telephone Etiquette. Chapter 10: Using New Rules for New Technology. Chapter 11: Communicating in the Business World. Part IV: That’s Entertainment! Meals, Parties, and Gifts. Chapter 12: Eating Meals with Elegance. Chapter 13: Drinking In the Wonders of Wine. Chapter 14: Hosting a Memorable Event. Chapter 15: Being a Gracious Guest. Chapter 16: Giving and Receiving Gifts with Class. Part V: Making the Most of Special Situations. Chapter 17: Marking Life’s Major Events. Chapter 18: I Do! Celebrating Engagements and Weddings. Chapter 19: On the Go: Travel Manners for Land, Sea, and Air. Chapter 20: Being Sensitive about Disabilities and Illnesses. Chapter 21: Ten Etiquette Tips for Children and Teens. Chapter 22: Ten (Or So) Tips for Tipping Appropriately.